ONLY 3 SLEEPS UNTIL THE RED THUNDER AIR SHOW TAKES OFF!! Save more than 15% when you purchase your tickets online rather than waiting in line at the entry gates. Check out the prices below. With only 3 days to go, Red Thunder is shaping up to be an extraordinary event. Saturday and Sunday weather predictions are set for pleasant weather and light winds. A great day for flying. Read below to find some helpful information to ensure that you have maximum enjoyment over the weekend. We now have an official programme released. 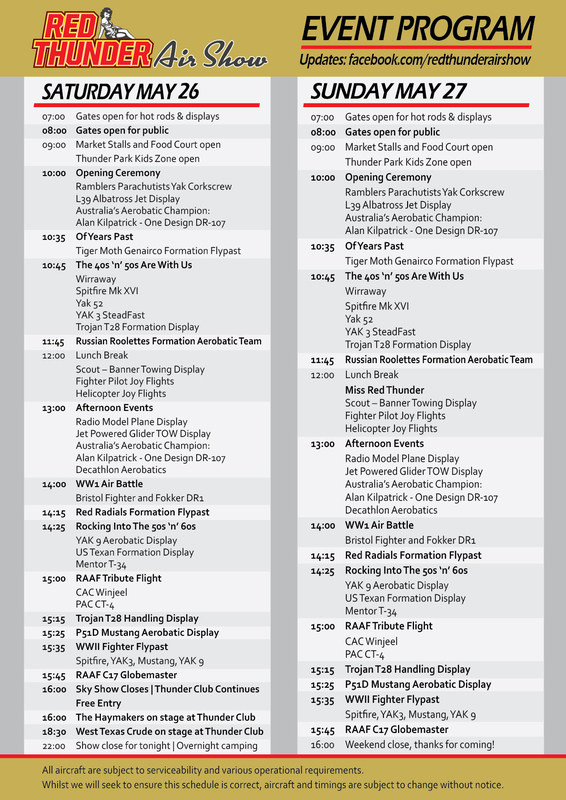 Click here to download your Red Thunder Air Show Program. We have lined up a programme of aircraft, hot rods, classic cars, a VIP indulgence and kids entertainment to ensure your all entertained. Enjoy the VIP tent, Markets, and the kids Thunder Park. See the ladies ‘Pin-Up’ competition, and revel in the sounds of West Texas Crude and the Hay Makers, all to a 50’s rockabilly theme! Do you consider yourself to be a Very Important Person? Thunder Club VIP is a brand new exclusive club for people who purchase VIP Gold Passes to this years event. 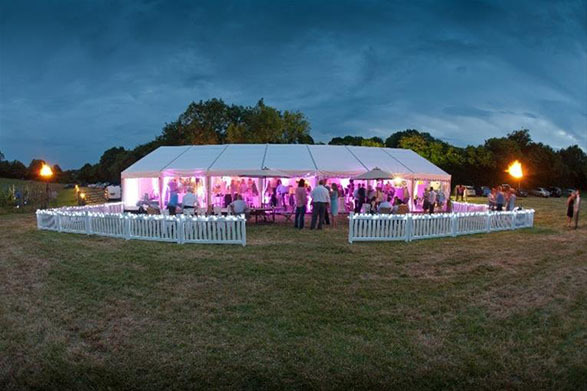 You will be treated to unobstructed views of the airshow, a special fenced off beer and wine garden, an opportunity to rub shoulders with the stars of the show, his and hers fresh water flushing toilets and lots more. Thunder Club VIP Gold Passes are limited so make sure you purchase your tickets now to ensure a space. Welcome to THUNDER PARK- an exciting part of the Air Show for the younger members of your family. There will be plenty of fun to be had with slides, jumping castles, dodgem cars and even a rock wall to climb. If that isn't enough for young thrill seekers, maybe you are brave enough to try the Storm Rider, a thrill ride not for the faint hearted. Read more about Thunder Park here. If your're thinking of eating, Red Thunder Air Show has you covered. There will be 18 food stalls and over 15 merchant stalls to keep your stomach and mind occupied. Keeping even the pickiest of eaters happy. Red Thunder will feature The German Sausage hut and Artisan Gelato & Sorbet. Online tickets are still available!! Save time and money by purchasing online! !